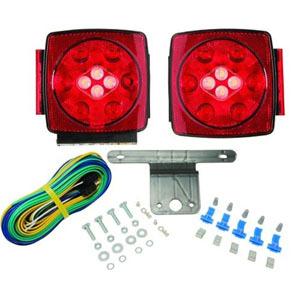 Tail Light Kit, Rectangular "Low Profile", Submersible And Incandescent. Approved For All Trailer Widths. Blazer Brand. Tail Light Kit, Square, Submersible, and Incandescent. Approved For All Trailer Widths. Blazer Brand. 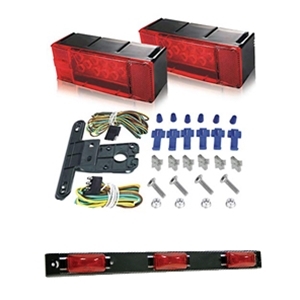 Tail Light Kit, Rectangular "Low Profile", Submersible, and LED. Approved For All Trailer Widths. Blazer Brand. Tail Light Kit, Square, Submersible, and LED. Approved For Trailers Under 80". Blazer Brand. Tail Light Kit, Square, Submersible, and LED. Approved For Trailers Under 80". Blazer Brand. .
3-Light Identification Bar, Submersible, LED, With Plastic Bar. 16" OAL. Optronics Brand. 3-Light Identification Bar, Submersible, Incandescent, With Plastic Base. 16" OAL. Optronics Brand. 3-Light Identification Bar, Submersible, Incandescent, With Stainless Steel Base. 14.25" OAL. Optronics Brand.